[Review] Who Scooped My Bagel? It may take a little explaining that founder and CEO of Georgetown Bagelry, Mary Beall Adler, didn’t exactly start the bagel baking business she’s most known for. That honor actually belongs to her former husband, but Georgetown Bagelry, based in the suburbs of Washington, D.C., entered into her governance after he upped and left a hole in her life. 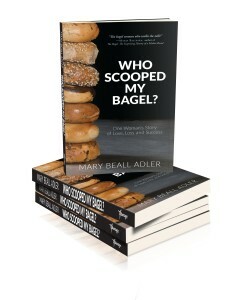 Yes it’s a long story, but Adler’s book “Who Scooped My Bagel? : One Woman’s Story of Love, Loss and Success” describes in painful detail how she stumbled onto her love for the humble bagel, the man who would introduce her to the business, and then later to the artisan bagel business itself. It’s painful because that journey of self discovery would be one that encompasses great personal loss, family struggles and seemingly insurmountable business challenges, an autobiography that may even bring a tear or three as you read Adler’s account of the past couple of decades of her life. But along the way, you’ll admire her sheer determination in not merely getting through with life, but excelling in every aspect. You’ll read how she was forced to make certain decisions in her business, even as she has to deal with troubles back home (even “exiling” a son to live with another family member so as to keep him from trouble). You’re likely to admire her creative approaches to marketing her business, but also her leadership and management style – I particularly like her idea of encouraging, even forcing, staff to take long walks once in a while so as to clear their heads before getting back into the grind. I’ll be honest and say that I wasn’t expecting much from “Who Scooped My Bagel?” initially, but Adler’s honest writing in the startling account of her personal and business lives as well as the amazing life insights that she shares makes this book a very pleasant revelation. And if you’re especially a mother trying to juggle both work and family at the same time, Adler’s book will have many useful lessons for you as well.